What does it take to survive? The answer of course varies depending on who you are and what your life’s journey entails. For my 12 year old son, Brendan Bjorn, the answer is, shall I say, complicated. His life is totally dependent upon someone caring for his every need on a 24/7 basis. When I say his every need, I mean just that: EVERY. SINGLE. NEED. And that someone who takes care of those needs is, in fact, me. I am his full-time carer. Every day, and each night, I lift his 34 kilos (74 pounds) of dead weight to move him where he needs to go – his bath chair, his wheelchair, his bed. I carefully dress him and undress him. I change his adult sized, frequently overflowing, nappy multiple times a day. I administer the medications that keep him alive – 3 seizure medications twice daily, 1 liver medication twice daily, 1 reflux medication twice daily, 2 puffs of steroid inhaler twice daily, 1 constipation medication at night, a prophylactic dose of antibiotic 3 times a week, and 1 round of Dioralyte fluid to keep him hydrated, given at night. And of course, there is the emergency rescue medication for seizures that go to the 3 minute mark, as well as oxygen for when he stops breathing in a seizure. I set up his daily feeding regime of formula given via a pump hooked up to a G-button peg surgically placed in his abdomen to be given at a certain rate over a certain time frame, and closely monitored because he is growing less tolerant of feeds, so I must be ready to shut it off at a moment’s notice if he starts to gag. I am his arms and hands – he cannot hold anything in his soft, but now contractured, hands. I am his legs – not only can’t he walk, but he can’t move his legs in bed should they get out of position on his specially designed cushion meant to hold them in place. I am his neck – he can’t hold his head up for more than 30 seconds at this point, so if I want him to look up to see something and he is unable, I must gently lift his head up for him with my hands. I am his voice – the non-verbal child with more complex needs than most any adult will ever have – I am his voice against a system that doesn’t want to know about him or his struggles, fighting wait lists and denials and doctors and therapists and special education personnel and…and it is never ending…but I am his tireless, advocating, voice. I am his nurse, his pharmacist, his doctor, his therapist, his case manager, his personal assistant, his teacher, his advocate, his body, his voice, his everything. And, I am his mother. His everloving, totally devoted mother. THAT IS WHAT IT TAKES FOR MY SON TO SURVIVE. Yes, I am his everything. And somewhere along the way, in order to be his everything, I have lost much of who I was. Tracy. Even as I type my own name, it feels as if I am referring to someone outside of myself. Tracy? Who is she? And with that question, it leaves me to wonder if I know what it takes for ME to survive. I survive on scraps of time sprinkled here and there during the week when I actually find a bit of alone time to compose my thoughts, to breathe, and to just be. I survive on the incredible love I so thankfully share with my 2 beautiful sons. They are indeed what sustains me, like the medicines that so vitally sustain my Brendan Bjorn. I survive on hope for a better future, in some undoubtedly unrealistic, magical way, that things will get better for us, that it won’t always be such an relentless struggle. I survive on very little sleep, on not enough money to pay bills, and on too much sugar, caffeine, antidepressants and ibuprofen. I survive despite the exhaustion, the loss of my career, my house, my financial safety net of retirement, adult conversation, and the loss of so many of my dreams. I survive, but most often, it is JUST BARELY. I exist. That shadow of my former self. And at times, I let my mind wander into the future and contemplate what will become of me (and my other son, Declan) when my precious Brendan Bjorn gains his angel wings. What will I do? This shadow of my former self, far too many years out of my career to have remained marketable; No savings or retirement to keep me and Declan secure because what we survive on financially amounts to FAR less than minimum wage for 24/7 work; A broken, aging body after years of such demanding physical care and now facing chronic health concerns of my own; And a shattered heart I will surely have, as well. HOW WILL WE SURVIVE THEN, WHEN THE CARING IS NO MORE? I address this to you, the person who does not (yet) actively support the campaign for rights, service and system reforms for the disabled and for their family caregivers. A bit about me: I’ve been on this challenging journey with my precious son who is severely disabled with profound medical needs and a life-limiting condition for over 12 years now. In those 12 years, I have never stopped trying to educate, advocate, create positive change and help support those on this journey with me. I established a national non-profit charity in America which, for 8 years, raised awareness nationwide about the common virus, cytomegalovirus aka: CMV, that damaged my son’s brain while I carried him inside of my body. The foundation also contributed toward research for a vaccine against CMV. 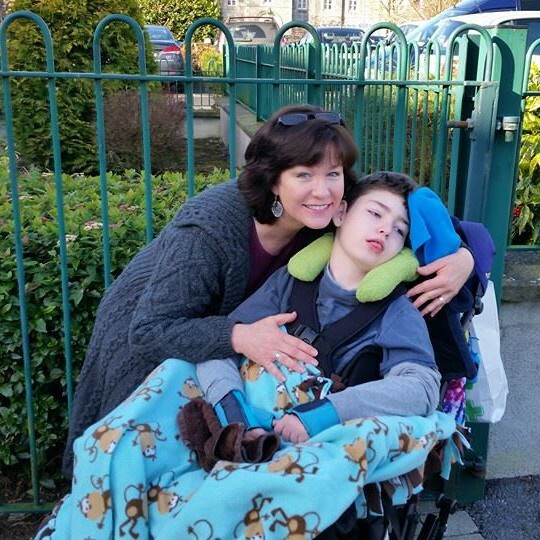 Back here in Ireland now, I continue to work raising awareness of issues surrounding families who are caring for their children with severe disabilities. All the while, I am a single parent to my 2 sons, both of whom depend on me to be the best mother I can possibly be. I have lost my much loved professional career because keeping down a job while caring full-time for a totally dependent, disabled, medically fragile child is frankly impossible without support. My own health has been involuntarily sacrificed as the constant stress has spawned an autoimmune disease which pains me daily; my back is literally crumbling with degenerating discs under the weight of lifting my son for 12 years; and my mental health has been put to the test time and time again battling depression and anxiety. Relationships have failed. Friendships have withered away. Hobbies, such as hiking in the mountains and taking leisurely walks to work on photography, have long been forgotten. Retirement funds once set up in hopes of a secure future in my old age no longer exist, giving way to the desperate goal to instead simply make ends meet, keep a roof over our heads and food on the table. I am challenging you to look deep within your own mind, your own heart, and ask yourself WHY don’t you find it worth your time to actively support the campaign for rights, service and system reforms for the disabled and for their family caregivers. I started this piece telling you what I have done. No, I am definitely not patting myself on the back, because often times I think I must be half-mad to keep doing all I am doing. But you see, I truly believe in doing what is right, for speaking up for those who cannot speak up for themselves, and for trying to make this world a better place than how I found it. I did it before my son was born, and I will continue to do so for as long as I live. And listen, we ALL have “other things” to keep us too busy, to focus our energy on, that we can use as a convenient reason for why there just isn’t time to speak out in support of disabled children and their families. I get it. Really, I DO. Like I said above, I am pretty damn busy as well. That is precisely why I don’t buy the “I’m too busy” excuse. So, I ask YOU again to examine your own heart and mind and ask yourself, what is it that is keeping you from fighting for these rights, service and system reforms in order for our severely disabled children and their families to have a positive and fair life experience? What exactly is it that stops you? Do you support animal rights? And if you do, is it because you have pets that you love but not a disabled child that you love so you can’t relate? Did you have the rainbow colours overlay your Facebook profile photo during the equality campaign last year? Did you march for it even though you are straight but because you knew this was what was fair, because love knows no bounds? Are you getting my drift here? Is my son, and children just like him across Ireland, not worth your time, too? Sometimes, my son and I get stared at as we walk through a shopping centre or down the street of a town. Other times, people turn away, diverting their eyes from…what? From a reality they cannot comprehend? From something they fear could happen to them? Sometimes, even family and close friends distance themselves from us – “us” being the parents of a severely disabled child. And sometimes they say things that should have been left unsaid. “You ought to put him in a home and just get on with your dreams, your life.” Worse yet, when a family member says, “If I was pregnant and had known my baby was going to have such extensive brain damage, I would have aborted it.” Yes…yes…I heard that one for myself, and it is emblazoned on my mind, always there to remind me that some people cannot cope with challenges beyond what colour to paint their nails. Bitterness remains, but it fuels my drive to help change people’s misguided perceptions of individuals with disabilities. It could very easily have been your child. Sometimes, I want to bury myself under a never-ending pile of blankets on my bed and not poke my head out of them for days. But instead, I stuff that desperate feeling, along with the hurtful, truly ignorant comments such as those above, into that place in my heart where darkness reigns. And then I close the door to that dungeon while I put on a brave face to get on with the day ahead of me. My two sons: my world. They are what keep me going. The energy of a healthy, bounding 8 year old. The extensive, constant needs of a gentle 12 year old with a fragile, failing body that houses the soul of an angel. I hold him in my arms as often as I can, though it is not as much as when he was younger, smaller, and far healthier. Look into those eyes of lovely innocence. Sometimes, it is the government that turns away. The very same government that is to be serving the people of the country, especially those most in need. Can they, too, like the person walking by us in the shopping centre, not bare to look into the eyes of a child with such profound needs that they instead divert their eyes and ignore those needs? Is it because they, too, cannot comprehend this reality? Or do we dare ponder if it is because they believe that there are those who deserve, and those who do not? They deserve the best quality of life possible, just like you. And the parents, like me, who are struggling to survive on every level imaginable, whose bodies are aching and falling apart, who wrestle with depression and anxiety and exhaustion daily, who no longer have a retirement fund to count on in our old age – which is approaching all too soon…what of us? Do you see us? Do you hear us? Do our cries go in vain? Or is it just too convenient to also turn away from us while turning away from our precious, vulnerable, totally dependent children? We, the carers, also deserve the best quality of life possible, just like you. I lift his body, day in and day out, 12 years now without fail. Pain yes, but the pain matters not. It must be done. For one day, he won’t be here to light up my world, and that knowledge serves to remind me in the cruelest of ways that what matters most in life is not fame, fortune, status or the latest trend. No, those things, like the pain, matter not. This, the pure love of a child who trusts me to care for his every need…this is what matters. I wipe the drool from his mouth as he smiles at the sight of me, and my heart is filled. Time and time again, it is filled with unimaginable, unconditional, love for him. Another week has gone by, but what a week it was. Today is Sunday, a day that I tend to stay home with my two boys and try to unwind while getting ready for the week ahead. This morning, so many thoughts and honestly not a lot of clarity. Earlier this week I had the wonderful opportunity to be on the Today with Sean O’Rourke show on RTE Radio One. (Please listen here: The Plight of Carers ) Since it aired, I have been blessed with contact from families across Ireland who are in the same shoes as myself, or very close to the same shoes. It has motivated me, inspired me, and furthered my resolve and commitment to helping create change for the better when it comes to our disabled children and their family caregivers. So, a huge THANK YOU all of you out there who fight the daily fight along with me! And, a tremendous, heart-felt thank you to Sean and all his staff for giving me the voice! Bless you. We gave it a go yesterday. It didn’t work so well. It was too long of a time to basically force ourselves out of the home so we could go “recharge”, which is what respite should be about. There was no recharging, despite my best efforts. We drove to Liffey Valley to get my glasses fixed and exchange some items at Dunne’s. Ok, we had lunch too, which was indeed nice enough, yes. The siblings of our special needs children often don’t get one-on-one time with their parent(s), so to hold his hand as we walked along was beautiful. STORY TIME: So there we were, my son Declan and I, standing in the queue at Dunne’s customer service. There was one lady in front of us waiting, no one behind us, and one lady being helped at the desk. Now here is where it gets interesting. The lady being helped was a Dunne’s employee. She had her uniform and nametag on, so there was no missing it. She was exchanging some wall hanging that seemed to have a mysterious origin because the gal at the till wasn’t sure what to do with it. At the end of the counter were 3…count them THREE…other Dunne’s employees all staring at a computer screen trying to find this item’s serial number. But wait, up walks employee number 6 to say she can’t locate the item on the floor. By this time, 2 other people joined the queue to watch this farcical fiasco. Being the bold, often outspoken person that I am, I politely commented aloud that since there were 2 other tills, maybe one of them could help the customers that were waiting. Two of them diverted their eyes from the computer screen to look at me, then went right back to ignoring me. The lady in front of me in the queue found me quite funny, giving a giggle and a wink to me. I said, “This reminds me of the joke, how many people does it take to change a light bulb?” She laughed again. And we waited. And waited. Finally, a second till was opened and we were relieved of our having to watch incompetence at it’s finest. Now, I know, I am being a bit harsh. But, here is what I was wondering while I was so impatiently waiting: Is this, at least in part, what happens in our government that makes the system so dysfunctional? Too many cooks in the kitchen all trying to figure out what the recipe calls for? Arguing about what spice to use, each clamoring to get a taste of it before the other guy, all the while no one paying attention to the fact that the dish they are attempting to create is getting burned? Let’s all think about that. Who is getting burned? How are the disabled and the carers in this country doing, really? Back to this week. A chance to have our story told – the story of all the families across Ireland who have a profoundly disabled child, no matter the age – and the struggles we face. A chance to announce a new campaign (Profound Ireland) to facilitate changes within the system that will better the lives of those with profound disabilities and the families who care for them. And a chance for me to give the 10 hour once-a-month respite a go. OH WAIT…strike that. When I got home, the nurse let me know she was told she was wrong. I don’t get 10 hours a month after all. I GET 8 HOURS PER MONTH. Back to the negotiating table, so it seems. Who is ready to join in and raise their voice with our families who have profoundly disabled children? Who is ready to work for system reform so that our families can have a fair, equal quality of life and the services and supports we need? And if not you, then who? During the first trimester of pregnancy with one of my 2 sons, I underwent extensive testing because of my age. One test came back with very high markers for neural tube defect. Another test, one for Down syndrome, came back with very bad odds as well, so they did a detailed ultrasound to look for physical markers of Down syndrome. They found two: my baby had a shorter femur than he should have, and the second one was the nuchal fold. I also found out the baby was a boy. It was 2 weeks of sheer hell as I waited to undergo another detailed ultrasound to once again measure for Down markers. They were still there. I cried for days on end. How was I going to do this? How?! Ultimately, scared to death after having previously had 5 miscarriages – the 4th one which was actually due to Down syndrome…a baby girl – I opted to have an amniocentesis done – despite the miscarriage risk. I had to know for certain if this little boy I was carrying had Down syndrome or any other challenges. I just had to know. I didn’t want to wait until the baby was born. I had the amniocentesis. There were no complications with the procedure and I went home to rest for the day. The doctor told me there would be 24 hour preliminary results, and then the confirmative results a week or so later. The day after the procedure, I got the phone call. The 24 hour results were in. The nurse said first of all they know the baby’s gender and asked did I want to know. I said how I had already found out during the ultrasound – which I did because I wanted to feel more bonded to this baby I was carrying who, for over a month at that point, was looking like he would be severely disabled. I named him the day I found out his gender. I didn’t tell anyone. I told him, though. And I would talk to him. I would pray, endlessly, that he be healthy. Please, God, please…I just cannot handle it if he isn’t healthy, I cried. Back to the nurse on the phone. The results of the amniocentesis were in. My baby boy was COMPLETELY HEALTHY. The tears streamed down my face as I shouted out THANK YOU, GOD!!! THANK YOU!!! That baby boy is now 8 years old. His name is Declan. And the day I got the call with the 24 hour results I was standing in the pre-op room with my severely disabled son Brendan Bjorn who was about to undergo major surgery on his hips. The nurses outside the room came in when they heard me shout out. They saw me cry and asked what happened. I told them and they hugged me. And despite a very difficult pregnancy with gestational diabetes, preeclampsia and an urgent C-section at 37 weeks, Declan was born healthy, vibrant, and a miracle like no other to me. So, why am I writing about this now? What does this have to do with my other son Brendan Bjorn and my writing that is centered on the journey with a child who has a life-limiting illness? There has been a lot of discussion lately in the news, both in Ireland and around the world, about children with disabilities being abused, and unborn babies testing positive for medical complications, and should people have to right to terminate or not. I’m not here to make that decision for anyone. What I am here to say is this: A disabled child’s life is of equal value and importance as that of a healthy child. Full stop. No doubt. Equal. Yesterday, I had a very thought-provoking conversation with a friend of mine who is also a special needs parent. We were discussing this very subject – how the life of a disabled child is of equal value and importance as that of a healthy child. Our conversation came around to our own special needs community and how even parents on this journey can undervalue the lives of disabled children by thinking that there is something understandable when a parent takes the life of their disabled child. They were exhausted, burnt out, they weren’t getting enough support, etc. I ask, does the child having been disabled make it any less of a tragedy that a child’s life has ended? Do we have a softer spot in our heart for that exhausted special needs parent as compared to a well-rested parent that ends the life of their healthy child? It’s a question that we don’t dare ask in our special community. We can’t face the answer. Or can we?